And Halloween has long been a time for superstitions, fortune telling and divination for precisely that reason. There are many wild creatures and natural features associated with predicting the future anyway, particularly so at this time of the year. Many of my British readers will probably associate a similar version of this centuries-old counting rhyme with magpies, which is probably how it originated, but our North American cousins seem to connect it more to crows (in fact, the aptly-named American rock band Counting Crows set this rhyme to music in their song A Murder Of One – a ‘murder’ in this context being but one of a number of collective nouns used for a group of crows). However, this chant is – as I am sure you have already figured out – actually a lot more than just a counting rhyme, and the original concept behind it is an ancient one. This rhyme is a small part of what is known as the Crow Augury, a concept that has been around in one form or another since at least Roman times. An augury is a method of divination that uses observation of natural phenomena and the behaviour of wild creatures (especially birds) to foretell the future, or to discern whether or not the gods would favour a specific course of action. This can involve anything from counting the numbers of a species at particular times or under particular circumstances to – and rather gruesomely, it must be said! – examining their entrails or other parts of the carcass for prophetic signs. 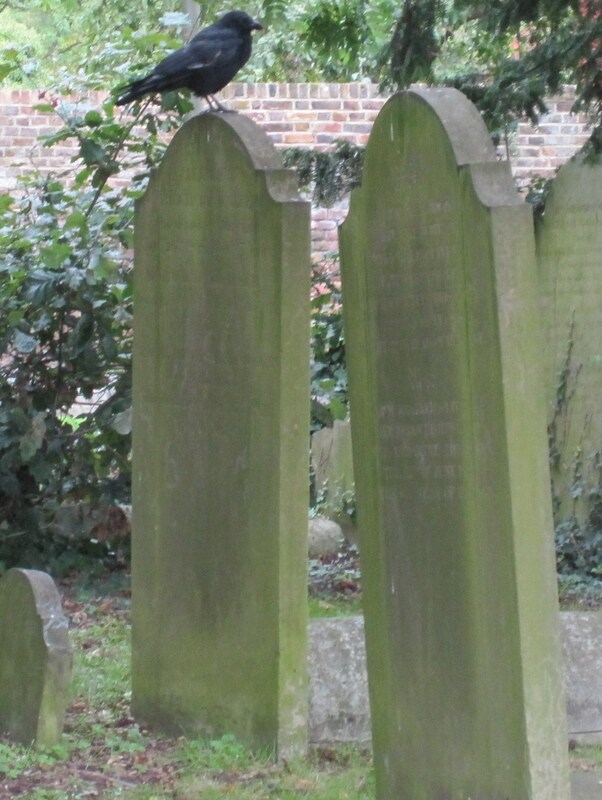 This was one of those lucky shots; the crow flew into my field of vision just as I was taking some pictures of the fascinating centuries-old gravestones in the churchyard, and I managed to snap him as he perched mysteriously (and very photogenically!) on this particular headstone. However, according to the list of corvid superstitions at The Raven’s Aviary, to spot a crow in a churchyard is actually bad luck – although, understandably, I hope that’s not so in this case! Over the years, it has become a bit of a tradition for me to post some spooky stories and/or seasonal facts on my blog at Halloween (read last year’s ghostly goings on here, for example), so watch out for more to come over the next couple of days!